Canadian entrepreneur and Tesla advocate Trevor Page has published a simplified video presentation today explaining what Tesla's battery pack consists of based on years of observations and little details he gathered and learned over 10 years of following the company's achievements. The 10 minute video compares the size differences between AA size cylindrical battery cell (14mm x 50mm), Tesla's current Panasonic 18650 Li-Ion battery cells (18mm x 65mm) used in a Model S and X and its future 20700 battery cells (20mm x 70mm) destined for mass production in the Model 3 by end of 2017. Trevor has calculated a 30% increase in volume capacity of the new Model 3 battery cells mainly to reduce costs. According to Jeff Evanson, VP Global Investor Relations at Tesla Motors, the Model 3's battery pack will have a capacity less than 60kWh. 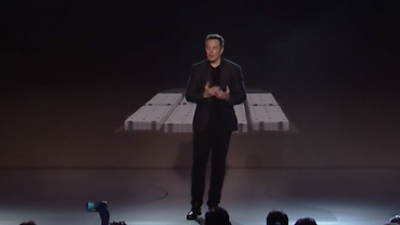 During Elon's unveiling presentation of the Model 3, you can see a 3D Cad rendering of the Model 3 battery cells with 8 modules which look bigger and different than the Panasonic 18650 battery cell modules used on the Model S & X. Earlier this year, Tesla Director of Battery Engineering Kurt Kelty affirmed that Tesla will reduce cell costs 30% by optimizing the cell's chemistry and mechanical design while using the new 8 modules form factor which is designed specifically for electric vehicles. Tesla began using cylindrical cells starting with the Roadster (cylindrical cells were popularly used in laptops and commercially available in large quantities). Their thermal management system was based on this cell format and has been tweaked - since then - to optimize battery efficiency in the Model S and X. Other electric car manufacturers like GM and Nissan use the prismatic or pouch rectangular cell format in combination with a different thermal management system design that copes with extreme weather conditions. 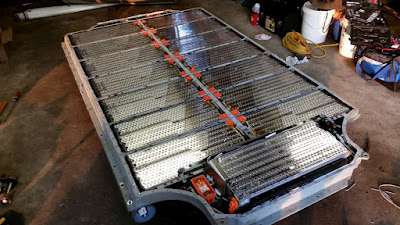 Tesla Model S 85kWh or 90kWh battery pack consists of 16 battery modules (in the case of a 60kWh or 75kWh battery pack, some battery modules have blanks inserted in them instead of actual cells, thus reducing its capacity and weight). Every module has 444 Panasonic 18650 battery cells arranged vertically and surrounded by a glycol coolant (used in radiators). Additionally, Tesla coats all the cells with an intumescent coating which isolates and prevents thermal runaway from affecting any adjacent cells. On top of the modules lies an aluminum sheet separated into several segments and perforated with holes that are linked to each battery cell with a thin wire, acting as a fusible link and cutting the current flow if a cell starts overheating. Every module sits in a wielded aluminum box weighing approximately 250 pounds and contains a circuit board for Battery Management System (BMS) which is connected to the main board of the vehicle and monitors the state of the battery modules. The boxes are separated by firewalls with safety vents, allowing a controlled release of gas - in the event of a rapid increase in cell pressure - down and away from the passenger compartment. While 2 rows of 7 modules are arranged side by side, the last 2 modules are stacked on top of each other. Those 2 stacked modules are surrounded by pumps and circuitry. The bottom of the battery pack is protected by a 1/4 inch aluminum armor plate against perforations and intrusions, while the frame is completely water sealed thanks to a thick goo similar to Proseal, used in the aviation industry as a fuel tank sealant.